Tibetan spiritual leader His Holiness the Dalai Lama gestures while answering media questions in Dharamshala on March 16, 2008.
Who'd want to be the Dalai Lama? Bearing the burden of an entire people's frustration, anger and despair over half a century can't be easy at the best of times for their exiled spiritual leader. But since the anti-Chinese demonstrations began in and outside Tibet on March 10, the Dalai Lama has found himself confronting a swelling tide of opposition and defiance from within his community. So, on the one hand, he has to contend with Beijing calling him the mastermind of the violent protests in Lhasa, and to walk a diplomatic tightrope with the Indian authorities that host his government-in-exile but value their relationship with China; on the other hand he has to try and rein in the more violent and provocative elements among Tibetans whose actions, he fears, will damage his people's cause. For a brief moment on Tuesday, the usually unflappable Dalai Lama let his frustration show, when he told reporters in Dharamsala, "If things are getting out of control, then the option is to completely resign, completely resign!" he said, waving his arms for emphasis. He said he would meet on Wednesday with Tibetan marchers trying to cross the border from India and tell them to stop, as they are "making things difficult for the Indian government". He added, "What's the use of some clash with Chinese soldiers on the border?" The Dalai Lama's comments came as a dampener for organizers of the Tibetan People's Uprising Movement, who had been hoping that if the Dalai Lama could not lend his support to the march, he would at least refrain from opposing it. Four of the five organizations involved in the movement oppose the Dalai Lama's "middle path" approach of seeking dialogue with the Chinese leadership in search of a "genuine" autonomy for Tibet. They want direct action to seek independence from China, and they want to it now, while the world is watching China as it prepares to host the Olympic Games this summer. Earlier on Monday, march organizers had reacted with stunned disbelief to an announcement by Prime Minister Samdhong Rinpoche of the Tibetan government-in-exile that it would form a committee to coordinate all the protests within India. Some were peeved that the government was trying to steal their show, while others worried it would leave the protests hamstrung. "As a youth movement, we can protest in various ways," said Tsering Choedup, one of the coordinators of the march, "but if the government comes in, bureaucracy and diplomacy will take over." Once the Tibetan government-in-exile was in charge, those marching to Tibet in defiance of an Indian government ban would have to stop, while further protests outside Chinese embassies would also be ruled out. 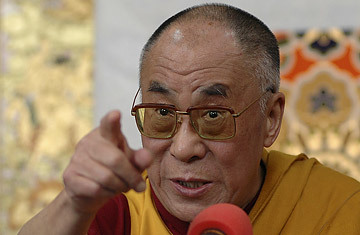 Before the intervention of the Dalai Lama, India-based Tibetan activists believed they had the momentum. "The scale of the uprising, its spread, is wider than 1959," Tenzin Tsundue, a charismatic Tibetan writer-activist, told TIME from Indian police detention in Jwalamukhi. "We've achieved in three days what we were hoping to achieve in three months." Tsundue had been among the first batch of 101 marchers held on Thursday by Indian authorities. Organizers were also hoping the protests within Tibet and China would gather steam. "Much as we are sad for our brothers and sisters in Tibet, we want the protests to continue," said B. Tsering, president of the Tibetan Women's Association. But since the passing of the Chinese deadline for the protestors to surrender at midnight Monday, the organizers of the protests in India have been treading a thin line between hope and despair  protests seem to have calmed down in Tibet and China, but every news of new protests and arrests brings a tiny blip of hope. They're far from ready to give up the protest altogether. Asked if they'd stop the march if asked to do so by the Dalai Lama, Tsewang Rigzin, president of the Tibetan Youth Congress, answered with an emphatic: "No." The schism within Tibetan ranks is set to widen.